We operate a professional wildlife removal company in Gainesville, Florida. We perform a wide variety of solutions to pest critter problems. Call us 24/7 to discuss your wildlife issue, and to schedule a same-day or next-day appointment. We look forward to hearing from you! Gainesville Animal Trapping: We provide humane animal trapping services. We are familiar with the common nuisance species in Jacksonville, which include raccoons, opossums, armadillos, squirrels, and more. If these critters are causing a problem, we set the appropriate traps to gently catch and relocate the animals at least 10 miles from your home. Trapping is not simple, and it is governed by strict Florida wildlife laws, so it is not a job for homeowners. 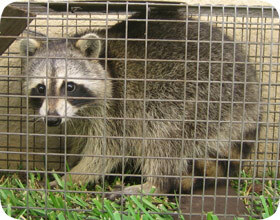 We do Gainesville raccoon removal, Gainesville armadillo trapping, and more. Gainesville Home Inspections: We most commonly deal with animals inside homes. Raccoons in the attic, squirrels in the eaves, rats in the walls, etc. The problem will never be solved unless we perform an inpsection of your house to find out how the critters are getting inside. Could be open vent screens, eave gaps, loose siding, or dozens of other places. We perform Gainesville squirrel removal, Gainesville bird control, Gainesville snake removal, and more. Wildlife Damage & Entry Hole Repairs: In order to solve the Gainesville critter problem, we need to seal the entry holes shut. We perform professional contractor-grade repairs on your home to ensure that wildlife cannot re-enter your house, and we guarantee our repairs. These repairs are a crucial step in Gainesville rodent extermination, Gainesville rat control, Gainesville bat removal, and more. My name is Scott, and I operate the Gainesville branch of Florida Wildlife Control. My business name is Alachua Wildlife Specialists I operate throughout Alachua and Marion County, and service the whole north central Florida, south to Ocala. You can give me a phone call on my business cell at any time, 24/7. I look forward to hearing from you! My answer: The best solution is for your crummy, lazy, and cruel trapper to get up there in the attic and find the young!